Though I’m not a fan of the genre, X-Men has always been rather intriguing to me, solely due to its unusual premise: it’s not about one man, nor four, trying to save the day – it’s a battle between two diverging opinions; and it didn’t start with a radioactive spider, nor a mid-life crisis, but with a declaration of war. If we simply overlook the mutant aspect of it, it’s not only realistic, it’s happening right now, as it has been for centuries – so X-Men is in fact the oldest tale on earth in the hands of unlimited imagination. I can’t speak for the comic books (and the cartoons are no example, here), but these films deal with issues of a moral depth and complexity that are unusual in the genre (I’ll make an exception for Christopher Nolan‘s Batman trilogy). And for that, it caught our attention, and earned our consideration. Or at least mine. First Class focuses on two of the most iconic and enigmatic characters of the saga, Professor X and Magneto. They maintain a rather paradoxical relationship as they’re the front face of each army. Faces that have obviously changed: until The Last Stand, Patrick Stewart and Ian McKellen were the actors who played them; here, it’s James McAvoy and Michael Fassbender. 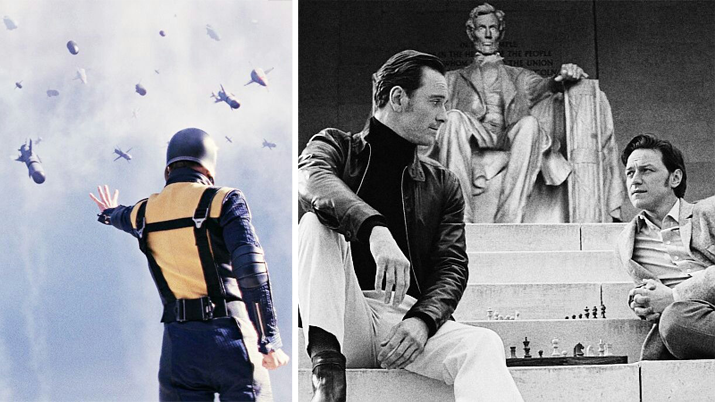 Yet even though the characters are technically the same, we’re introduced to two men that are barely recognizable, for just like the trailer said, before they were Professor X and Magneto, they were Charles and Erik. This is certainly one of the reasons why we have no objections with McAvoy and Fassbender being the newest additions to the X-Men films. Another reason is that this blend of scottish and irish is an undeniable success. These days, it’s unfortunately rare to find two talented young actors who work so wonderfully together, embodying the true meaning of star-power and on-screen chemistry. And like the best of duos, this is maintained outside the set (or at least in interviews). If not indispensable, this component is a great advantage when portraying the bond between Erik and Charles. As the film’s core, it is a complex, powerful, and surprisingly moving friendship. As viewers, we witness its unlikely start and precious growth with the utmost delight. Yet, this being a prequel, we know how it ends, and so we expect and watch with sorrow its fall. There are, however, a few key elements that prevent this film from reaching perfection. The most relevant of which would be the disappointing shallowness of the minor characters – most fail to impress, and some are borderline annoying. Also, even though the actions sequences are creative, the special effects are not that special. Although, in all honestly, this last one didn’t bother me the slightest bit, because from my perspective, X-Men: First Class is the tale of two men united by a cause that was bound to set them apart (do ignore the cliché) – its compromise is with depicting this relationship, and at that, it excels.